What started as a consumer-facing app, morphed into a media and polling solution, which eventually was converted into their current Enterprise type solutions. Their game show in real-time business model changed from a consumer site to an employee engagement business, to the fact that they are now partnering with social networks. Wayin is located in Denver and has 35 employees. They are currently hiring two engineers for any interested Sports Techie. Their goal is to reach more people and audiences everywhere using hashtags, twitter handles and keywords, while improving client’s workflow and data tracking. The ability to Identify, Moderate and Visualize is appealing to users, sponsors and advertisers. Their proprietary platform is flexible. It can integrate with mobile, website, TV and social web content second screens for live events and marketing campaigns. It has an Admin interface, a widget library and the option to customize visuals. Their robust analytic tools can track volume, drill down on audience demographics, identify influencers, celebrities and trending topics, while using a customizable dashboard. Users can provide custom search parameters. All this data is can be exported to Excel. They also provide tweets to screen, social media counters and trending topic lists, trending graphics and unique polls. Because they are Twitter Certified, Wayin has full access to data, user generated content and conversations. 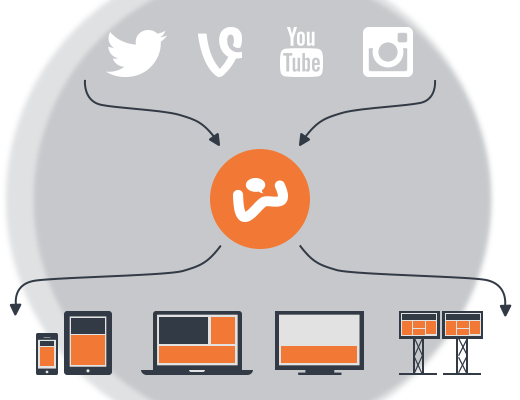 Wayin Hub works seamlessly with Twitter, Vine and Instagram. With YouTube, Facebook and other social media platforms there are ways to inject content into customized cells using API’s and HTML. Broadcast real-time intelligence of audience engagement with shows. The recent acquisition of Comenta TV, located in South America, gives them an established broadcast display and analytics services company that Wayin will incorporate into a new standard for a unified solution offering. They acquired Comenta TV to beef up their social content portfolio which will result in an increased ability to track analytics and engage with celebrity content. Besides working with the Mavs, Wayin works with Mark Cuban’s AXS TV entertainment TV channel here in the United States. The network is owned by a group consisting of AXS TV LLC (a company founded by investor Mark Cuban in 2001 as HDNet, Inc.), Ryan Seacrest (through Ryan Seacrest Media), Anschutz Entertainment Group and Creative Artists Agency, a business move that saw the channel rebrand from HDNet. Wayin powers the NHL social showdown and have the Sharks and Predators as customers. 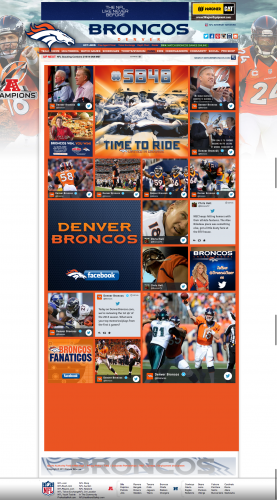 The Denver Broncos fans love to engage on social media, especially during Super Bowl 48 week, gameday and post-game. You can see live Sporting News here and Weather Channel Experience can be found here. I asked about the Sounders FC and it turns out Wayin was part of a playoff campaign. I was one of the first 50 employees at Seattle’s Best Coffee so I was curious to find out about their campaign with Wayin that revolved around a taste campaign for Starbucks. The Pac-12’s Oregon State football team used Wayin Hub on National Signing Day to help set their program apart on the recruiting trail. The hot sports business topics we discussed were helping to provide revenue streams, and the newest trend inside Stadiums of using a tweet board on a live scoreboard or big screen that displays fan and sponsor tweets and the ever popular selfie images, such as was done at the 2013 SXSW event where Shaq got involved. Pricing was set at $10,000 per month or $100,000 a year however that is in the process of changing since the sales packages are being tweaked with even more useful functionality. Look for the NCAA Men’s basketball March Madness tournament and the Rio FIFA World Cup in Brazil to be upcoming events that Wayin may target. She mentioned heat maps, multi-thermal imaging and even augmented reality, as possible new tech they will interface with this year. Competitors include Mass Relevance and other social media centric companies that help build social experiences into marketing strategies. Additional International expansion is on their business development agenda. Their exit strategy is to stay on the winding path they are currently on. She did share an interesting fact with me about the New York Fashion week and how a company paid in twitter currency. I wonder if this will become a new way of business on Twitter in the near future. Finally, be sure and visit with Kelsey at the Wayin booth at the NAB show SPROCKIT 2014 in April. Sports Techie, I spoke with Kelsey the week after SB 48 and her description of Broncos Media Day was spot on. Her excitement after working for nearly three years at Wayin is easy to detect. The companies ability to offer better branding to clients and sponsors with year-round solutions is a massive sport business formula for success thus far. I am the former content curator for the New York Giants official historical wiki, the Houston Rockets online community, HBO Entourage, and I wrote a DWTS blog for MSN, as the sports and entertainment moderator for Wetpaint located here in Seattle. Six years later, Wayin can not only moderate any four-letter words out of a conversation, they can customize their Admin tools and widgets to match clients specific needs, and much more. The fast-growing business of curating social media feeds and pages is upon us and with it a new opportunity to monetize content. Try Wayin if you are in need of a Twitter certified company that has the kinds of bells and whistles that the AFC Champions used all the way to MetLife stadium and SB48.